Before we get into the meat of this post, allow me to say I hope all of you are enjoying, or have recently enjoyed, your Easter Holiday. As for us, it is a sunny, summery day here in Sussex – the hottest day in April since 1949 and the warmest April since records began – and we are taking full advantage of it by lounging around the sitting room complaining about the heat. We did take a walk through town this morning, expecting to see it empty and shut up, but apparently there were a lot of people like us who had nothing else to do and thought a stroll down the high street would be just the ticket. And the number of open shops was scandalous; I thought there were laws against trading on Easter! If I hadn't know it was Easter Sunday, I would never have guessed; it looked just like another weekend, and I find that a bit sad. On the up side, KFC was open, so you could, if you wanted, bring your Easter dinner home in a bucket. And from the look of the queue out the door, a lot of people did. Anyway, after a pleasant walk around the park I have returned to my ‘office’ – the corner of the dining table – to work on The Cover. 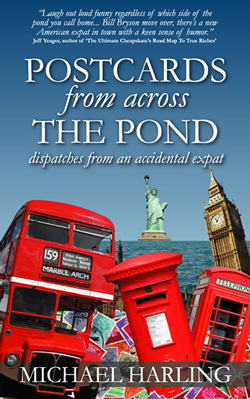 The sequel to Postcard from across the Pond (titled More Postcards from across the Pond because I couldn’t stretch my imagination any farther than that) is well under way, and this weekend I put away my Editor’s hat in order to become head of the Art Department., which means designing a cover for the new book. This shouldn’t be an onerous job; in order to make the brand easily recognizable, the new cover is the same basic design as the original. The difference is, instead of British icons in the foreground with America over the horizon, I decided to reverse it, with American icons in the fore. And that is where the trouble started. American icons? Simple, the Capitol Building, the Space Shuttle, the White House, Mt Rushmore, the Lincoln Memorial, the Washington Monument… But as I pulled them together I found they had more in common besides being representative of America—they were all white. This made for a very dull cover, so I tried again: a mailbox, cheerleaders, cup of coffee, a diner…all white-based if not totally white. So I looked again, and found an off-white mailbox, a red car, the Statue of Liberty, a diner sign with some turquoise in it and a back drop of a collage of US money, which merely replaced the white theme with a green-based one. 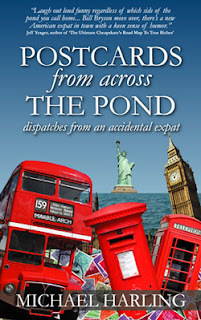 Now when I look at the new cover, I think of a Caribbean holiday. So I’m back at the drawing board, trying to find a small group of items that represent the US—and is not registered McTrademarks—that are not all the same muted hue. I’m tempted to leave it as it is, because a bland and monochrome cover would be a good metaphor for America—where else can you travel three thousand miles and still find the same stores and know exactly what is on the menu in any restaurant you enter—but, unfortunately, it makes an abysmal cover, unless I target those people who remember the Beatles’ classic White album. I am still laughing about the first paragraph. Proof positive that you can never move back to the states. The inability to cope with hot weather. Yes, and it was only 80 degrees. I can't imagine spending another 90-100 degree summer in NY! Why not just go with some different British icons, otherwise won't people think you're a Brit who's moved to the US? Buck palace, perhaps, a black cab, the union flag, Wills and Kate, and you can always re-use some of the stuff that's on the first cover. Though it would be nice to have something that wasn't so London-centric, but then I suppose that's what people recognise. No idea about US icons. What do I think of... Statue of Liberty definitely, Mount Rushmore, the White House, the stars and stripes flag... um, that's about it! A stetson perhaps. Or a gun!Or a yellow cab. Or a cheerleader. No idea what the other monuments you mention look like. Or how about a map of the US with some little icons on various states? Or has someone else already done that? Or similarly, a map of Britain (make sure that Wales, Scotland and probably Ireland too are marked, not just bloody London!) You could put on Edinburgh castle, something Shakespeare-ish, erm... some sheep in Wales? (oh dear, I'm Welsh, I'm not supposed to perpetuate that stereotype. Oops.) Perhaps some litter for London as it's so disgusting? Mrs. Baum: I'm not sure why I went with the reverse of the original cover, just seemed the thing to do, and never once did I consider it would look like it was written by a Brit who had moved to the US. 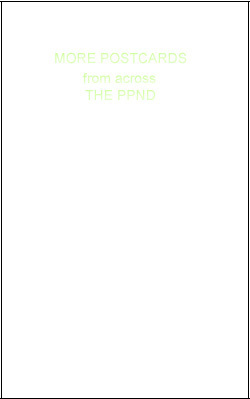 Too late now; I finally settled on a cover. It's not perfect, but it's good enough. Will post it soon. And if you're offering to proof read the manuscript, I'm listening. Send me an e-mail and we'll discuss.